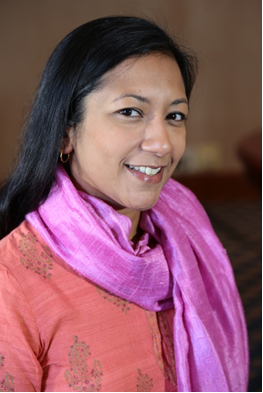 This month’s Inspirational Interview is with Lakshmi Sundaram, a Global Coordinator of Girls, Not Brides. Lakshmi helps Partnership members work together to bring the issue of child marriage to global attention and to be more effective in addressing the problem. She plays a pivotal role in linking the Partnership’s members, facilitating their joint efforts in advocacy and communications, and supporting members to learn from each other about effective approaches to ending child marriage. Find out more about Girls, Not Brides at www.GirlsNotBrides.org or follow them on Twitter @GirlsNotBrides and Facebook. Part 2 of this interview will be published on Monday 30 September 2013. 1. 14 million girls are married every year before they reach their 18th birthday. This is a staggering number and there is an urgent need for the work of your organisation. Where, when, and how did ‘Girls Not Brides’ begin? Girls Not Brides was founded by The Elders, a group of independent global leaders, currently chaired by Kofi Annan, who use their collective experience and influence for peace, justice, and human rights worldwide. The Elders took up the issue of child marriage because they are committed to upholding the human rights of women and girls worldwide. The sheer scale of child marriage, its impact on girls’ wellbeing and prospects, as well as the historical lack of attention on the issue, spurred them to action. The Elders launched Girls Not Brides: the Global Partnership to End Child Marriage in September 2011 to enhance, strengthen, and accelerate already existing efforts to prevent child marriage and support child brides. They were also keen on bringing people together who have long had to work in isolation on this sensitive issue. 2. It is more common for young girls to be forced into an early marriage in the developing world. Why is this? A principal driver of child marriage is poverty. When families live in poverty, they may feel they have little option but to marry off their daughters; that by doing, so they can reduce family expenses, ensuring they have one less person to feed, clothe, and educate. In communities where a dowry is paid, it can be welcome income for poor families. We also see instances, particularly in areas where girls may face high risk of sexual or physical assault, where parents marry off their daughters because they believe that marriage will be the best way to ensure the safety of these girls. Sadly, the reality is that child marriage is not a safe option. Girls who marry before the age of 18 are more likely to experience violence within marriage than girls who marry later, and they are more likely to describe their first sexual experience as forced. We have to realise that child marriage is driven by a more fundamental issue – that of inequality between women and men, girls and boys. In many communities where child marriage is practiced, girls are not valued as much as boys – they are seen as a burden. They are seen not as individuals, but purely as future wives and mothers. Decisions are made for them and girls are left with little or no say in when or whom they marry. 3. Childhood marriage is in direct contradiction to 6 out of the 8 Millennium Development goals. Please tell us more about this. There are many ways in which child marriage undermines what we’re trying to achieve through the Millennium Development Goals – to eradicate extreme poverty, achieve universal education, promote gender equality, and combat HIV/AIDS. If we look, for example, at Goals 4 and 5 – to reduce child mortality and improve maternal health – we can see the devastating impact of this practice. Child brides are under intense pressure to prove their fertility, which means they tend to have early and frequent pregnancies. The dangers of this cannot be underestimated: girls under 15 are five times more likely to die in childbirth than women in their 20s. The children of child brides are also 60% more likely to die before their first birthday than the children of mothers under 18. There’s growing recognition that the needs and rights of adolescent girls are overlooked in the Millennium Development Goals. The Goals focused on infants, mothers, and primary schooling; little was done to address the crucial transition to adolescence. That’s why, as governments discuss at the United Nations a new development framework for the international community, we’re calling for them to explicitly address the needs and rights of girls and the practices, like child marriage, that hold them back. 4. You quote Graça Machel, Nelson Mandela’s wife, on your website, “Traditions are made by people – we can change them.” What role does tradition play in childhood marriage and how can we change the most traditional of societies? Tradition plays a big part in perpetuating child marriage. In many places, child marriage happens simply because that is the way things have always been and straying from that tradition could mean exclusion from the community. Changing these traditions takes a long time, but it is possible. We’ve seen it with practices like foot binding in China, which was entrenched for generations but ended within a single generation. Bringing about change takes a combination of factors, but one crucial element is to bring on board those who are respected and who have influence within a community – be they community elders, religious or traditional leaders. Once they are convinced of the benefits of ending child marriage, both for girls and the wider community, they can be some of the most effective advocates for change. 5. What is the social and economic impact of young girls being married too young? What do you think the world would look like, in both economic and social terms, if early childhood marriage didn’t exist and all girls went to school? There hasn’t been an in-depth study as of yet about the economic impact of child marriage, but it is fair to say that child marriage stifles opportunities for girls. Child brides usually drop out of school and they don’t receive the educational and economic opportunities that help lift them and their families out of poverty. They are more likely to be poor and remain poor. In terms of social impact, the effects of child marriage are also broad. When girls marry as children they are hard to reach with programmes and services. All too often they drop off our radar, leaving them isolated and marginalised. This happens to 14 million girls every year worldwide.